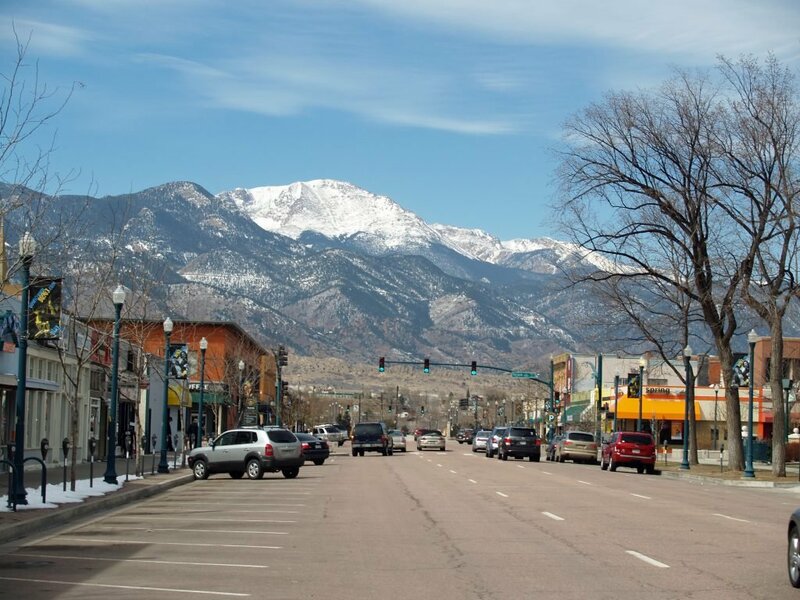 Colorado Springs, which sits at the base of Pikes Peak and the Rocky Mountains, has long been a tourism destination. The second largest city in Colorado behind Denver, Colorado Springs offers a host of quality RV parks to go with an impressive list of golf courses. Two good examples include Mountaindale Cabins and RV Resort and Cheyenne Shadows Golf Club at Fort Carson. Featuring 75 sites on a 45-acre wooded area, Mountaindale offers all the necessary amenities and then some. Built to accommodate pull-throughs and big rigs, the pet-friendly facility has 30/50 amp electrical, water, sewer, showers, Wi-Fi, a recreation room, and lots of nearby trails. The location of Mountaindale Cabins and RV Resort is superb as visitors have access to many other attractions in the surrounding area. Anywhere in the greater Colorado Springs area you’re bound to be close to a golf course. Such is the case when staying at Mountaindale Resort. About a dozen miles down the street you’ll find Cheyenne Shadows Golf Club at Fort Carson. 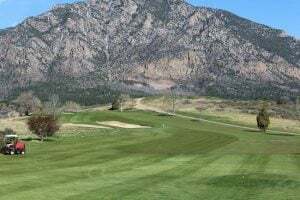 Open to the public, this par 72, 18-hole championship course sits at the base of Cheyenne Mountain and offers dramatic views from almost anywhere on the course. Open year-round, weather permitting, the course stretches to 6,919 yards from the tips. Well-groomed fairways and greens keep Cheyenne Shadows Golf Club difficult yet friendly. Mulligan’s Grill is a great place to reflect on your scorecard while having lunch or a beverage. A note of caution when golfing in Colorado: Since you are golfing at about 6,000 feet of elevation, make sure to stay hydrated to prevent altitude sickness. Another course worth mentioning is Antler Creek Golf Course, which is reported to be the second longest course in the country at 8,114 yards. Despite its intimidating length, Antler Creek is still a very player-friendly course. The aesthetically-appealing track features three lakes and 73 bunkers. Pikes Peak should certainly be visited when in the area, and there are many ways of getting to the top. At an altitude of 14,115 feet above sea level, Pikes Peak is the second most-visited mountain in the world, following only Japan’s Mount Fuji. The 19-mile Pikes Peak Highway is paved to the summit and is open year-round, weather permitting. Some visitors choose to take the 8.9-mile Cog Railway to the summit (currently closed for 2018), while others go on foot using Barr Trail. About 15,000 people a year attempt to climb Pikes Peak on foot. The 13-mile Barr Trail begins at the base of Pikes Peak in Manitou Springs. However you get to the top, you’ll certainly enjoy the view! The Pikes Peak Highway entrance is located 15 minutes west of Colorado Springs on Highway 24. The Cadet Chapel is the most visited man-made tourist attraction in Colorado. This aluminum, glass and steel structure features 17 spires that shoot 150 feet into the sky. It is considered among the most beautiful examples of modern American academic architecture. To visit the chapel, stop at the Barry Goldwater Air Force Academy Visitor Center, which is open to the public every day from 9:00 a.m. to 5:00 p.m. The entire world spent two weeks in February watching athletes perform during the Winter Olympics in South Korea. In preparation for the Olympic Games, both summer and winter, athletes will spend untold hours and sometimes years training in preparation for their 15-minutes of fame. More than 130,000 people come to tour the U.S. Olympic Training Center in Colorado Springs each year. In 2019, the nation’s only U.S. Olympic Museum and Hall of Fame will open near downtown. The museum is expected to draw more than 350,000 visitors annually. There are 265 Olympians living in the state of Colorado, and 82 Olympians call Colorado Springs home. Colorado Springs boasts 9,000 acres of parkland used regularly by training athletes. For more information on Colorado Springs, go to VisitCoS.com. You can also read more about Mountaindale Cabins & RV Resort on Campground Reviews. I understand the Cog Railway to the summit of Pikes Peak is not in operation due to mechanical issues. FYI, the Cog Railway is CLOSED for 2018+. You left out the Garden of the Gods, second only to the Air Force Academy in the number of annual visitors. It is so popular during the peak summer season that the city is considering bus-only access to the park. Very true!! Garden of the Gods is surely something to see! We have been there many times as one of our sons live there. I have ridden horseback through it and if you haven’t, you should! You get a whole different prospective that way. My son and his wife often climbed there and my daughter-in-law does the marathon up Pikes Peak every year. Great place to live!!!!! Try riding horseback through the Garden of the Gods. Even better, as you cover more ground than walking, but see a lot more than driving through. 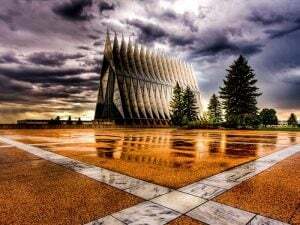 Visited Cadet Chapel late 2017. Docent shated chapel would soon be closed for remodeling. Hi, is the railway open this year 2019? The cog isn’t expected to be operational until Summer ’21. I highly recommend it. However, I do believe they have finished the construction that had the road closed if you were interested in driving up. I recommend it as well, just plan on taking a break about halfway down to let your brakes cool, as it would be the last place on Earth you’d want to lose braking. And it probably would be if you did. Meadow Muffins in Old Colorado Springs a very cool bar an grill. Cripple Creek is a 30 minute drive into the mountains is a casino town. Victor is a nearly deserted town just south of Crpple Creek the bar there serves the best pizza. For the adventurous, Phantom Canyon road was a narrow gauge railway goes south towards Canon City. No RVs on that road, plenty scaryin a sedan. Canon City has tall suspension bridge worth seeing. I lived in the area 10 years or so. NORAD znd FT. Carson Army base is also there.